Hi Andree...don't faint when you read this. I know it's been a while, but my latest post will give you an inkling. Daffodils...harbingers of spring...believe it or not we have bulbs peeping through the earth and it's the equivalent of autumn, but very warm, 29C today and rumoured to be 30C tomorrow. Summer's come back for a visit...no wonder the bulbs are confused. Lovely daffs, Andree. These perky flowers sure do know how to make Spring felt. The yellows are my favorite for this reason. They and the dandelions are hardy souls. 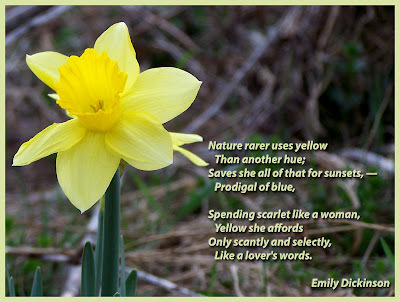 Good ol' Emily..."Scantly and selectly,/Like a lover's words." --these lines make me feel her loneliness. Yellow is such a happy and sunny color! What cool photos of beavers in this post ... wonderfully paired with Dickinson's poem!!! I used to love to watch them when we camped at Big Bear Lake each summer years ago. I’ve published BOTH this morning … my 2nd Camera Critters at Small Reflections and my 1st BYBS at Sacred Ruminations. I hope you’ll find time to visit. My brother basically "inherited" the house near the stream in Michigan Center where I lived taking care of my parents. I was over there the other evening and saw the daffodils had sprung up, and what a surprise it was! Even more surprising was seeing my brother out raking up last fall's leaves from the huge oak tree... after dark! I helped him, we had a talk, and things became quiet between us. Nature is mysteriously comforting that way.